Start and finish even count peyote stitch. Attach a stylish toggle clasp. 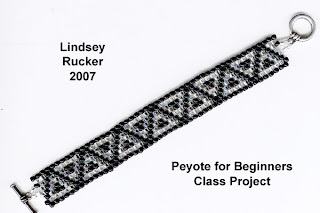 Students receive a handout containing instructions, the bracelet pattern, and links to free online resources such as special graph paper for peyote stitch, so they may design their own patterns in the future. The project will not be completed in class, but students will leave with all the skills necessary to complete the bracelet on their own. Cost: $15 class fee + the cost of materials. All materials required to complete the project are available for purchase during the class and students receive a 10% discount. All classes are hosted by ChaBre Beads.